Today the mobilisation staff visiting from Southampton completed their preparations of the ship for the next voyage. 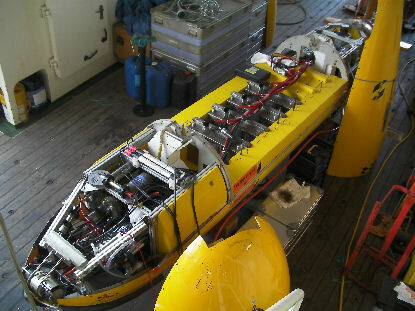 Several of the science party took the opportunity to visit a nearby beach, and the Autosub6000 team continued their checks of the vehicle after its shipping. Geophysicists Roger and Nancy drove around the island to find the nearest gravity base station, which they need to calibrate their instruments that measure local variations in the Earth's gravitational field caused by different types of rock in the crust. Bram and Veit have also continued to set up the HyBIS underwater vehicle - while sporting a new uniform of yellow boiler suits emblazoned with 'Team HyBIS' on their backs. Meanwhile, the ship received a visit from the British High Commissioner, who toured her facilities and heard about the expedition plans over lunch with team members Doug, Jon and Paul. In the afternoon, a local TV news crew from channel CNC3 filmed Doug, Jon and Diva talking about the expedition in the bright sunshine on the highest deck of the ship, on top of the bridge. Today was also 'signing on' day, when the scientists and engineers signed the 'Ship's Articles', officially becoming members of the ship's crew for the expedition. Later in the evening, the expedition team enjoyed a superb dinner ashore hosted by Diva's parents.